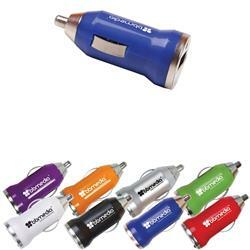 A great car charger promotional item needed by everyone. USB Car Power Adapter for all drivers. Simply plug in to your car power outlet and when LED indicator lights-up, plug in your USB cable to charge cell phones, MP3, iPhone, iPod, Digital camera, Blackberry, smart phones, plus all other such small electronic devices. CE certified. Input: 12-24VDC Output 5.0-1,000mA. 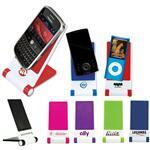 A FREE RUSH PROMOTIONAL ITEM! Production Times Available: 5 working days. ONE DAY RUSH AVAILABLE! Power supply / Technology: INPUT: 12-24 volts, OUTPUT: up to 5.0V/1,000mA.